Although they promise better deterrence at a lower cost, class actions are infected with problems that can keep them from delivering on this promise. One of these problems occurs when the agents for the class (the class representative and class counsel) advance their own interests at the expense of the class. Controlling agency cost, which often manifests itself at the time of settlement, has been the impetus behind a number of class-action reform proposals. This Article develops a proposal that, in conjunction with reforms in fee structure and opt-out rights, controls agency costs at the time of settlement. The idea is to allow the court, once a settlement has been achieved, to put the class’s claims up for auction, with the settlement acting as reserve price. 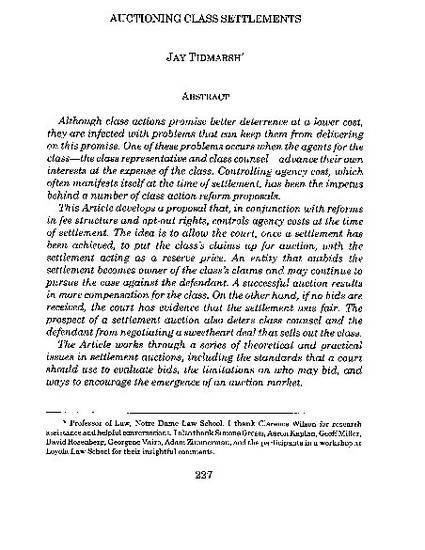 An entity that outbids the settlement becomes owner of the class’s claims, and may continue to pursue the case against the defendant. A successful auction results in more compensation for the class. On the other hand, if no bids are received, the court has evidence that the settlement was fair. The prospect of a settlement auction also deters class counsel and the defendant from negotiating a sweetheart deal that sells out the class. The Article works through a series of theoretical and practical issues of settlement auction, including the standards that a court should use to evaluate bids, the limitations on who may bid, and the ways to encourage the emergence of an auction market.